Freising is the oldest town between Regensburg in northern Bavaria and Bolzano in South Tyrol. 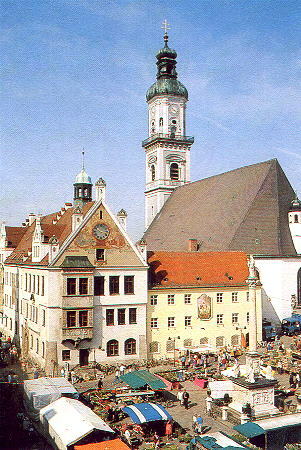 lt has been the seat of bishops since 739 and developed into a cultural and spiritual centre in Bavaria, long before the ducal towns ot Munich and Landshut. Many historic buildings and works of art serve as reminders ot its rich and important cultural past. The most outstanding sight in Freising is the Mariendom (St Mary's Cathedral) which was consecrated in 1250. The original building of this romanesque basilica had been destroyed by fire in 1159. The cathedral was the first brick structure to be built north of the Alps since ancient times. After the decline of the Roman Empire this method ot construction had sunk into oblivion. The tomb of St. Korbinian, the patron samt of the bishopric, is located in the crypt ot the cathedral. In the centre ot this four-nave crypt you can see one of the most distinguished sculptures in Europe carved out ot stone in the high Middle Ages: the so called Bestiensäule (the column of beasts) . In the late Middle Ages the bishops of Freising engaged the most renowned Bavarian artists of the time. Jörg von Halsbach, architect ot Munich's Frauenkirche (Church ot Our Lady), provided the Freising cathedral and the Benediktuskirche (Benedictine Church) with a gothic vault. The extraordinary lamenting group situated in the eastern apse of the northern lateral nave was created by the famous sculptur Erasmus Grasser. During the baroque renovation of the cathedral in 1724, Cosmas Damian and Egid Quirin Asam, the two most eminent Bavarian artists of the late baroque period, painted the frescos and applied the stuccoworks. Francois de Cuvillies and Johann Baptist Zimmermann, the two most outstanding South German rococo artists at the time, also worked in Freising. Zimmermann, who lived in Freising between 1715 to 1723, renovated the late Gothic cloister adioning the cathedral. With the numerous epitaphs dating back to the l4th to l8th century, the cloister ot the Freising cathedral houses the most comprehensive stone epitaph collection in Bavaria. The founding of the monastery by bishop Ermbert in 739 marked also the beginning ot the cathedral library. Within its walls many books were written and collected, as for example Abrogans, the oldest remaining book written in German. Francois de Cuvillies designed the stucco ceiling ot the baroque library hall. The Benediktuskirche (Benedictine Church) (ca. 1350), the late Gothic Jahanniskirche (Church of St. John) situated at the north side of the cathedral courtyard (1319-1321) and the renaissance courtyard of the residence ot the former prince-bishops is definitely worth seeing. The greatest collection of ecclesiastical art in Germany is presented in the nearby museum: the Diözesanmuseum houses paintings, textiles and goldsmith works of nine centuries. The most famous exhibits are of paintings and sculptures by Erasmus Grasser, Ignaz Günther, Peter Paul Rubens and the Lukasbild, a Byzantine St. Mary's icon. St. Georg (St. George) , built in 1440 by an unknown architect in late Gothic style, still towers over the old parts of Freising. In 1689 Antonio Riva, a native of the canton of Graubünden, erected the highest baroque clock4ower of Bavaria on the westside of this massive parish-church. Presumably Antonio Riva was also involved in planning and constructing the prince-episcopal lyceum at the Freising Marienplatz. In 1709 the baroque hall was ornated with ceiling frescos by Hans Georg Asam, father of the famous Cosmas Damian and Egid Quirin Asam. The stuccowork ot the ceiling, which is unique in Bavaria, was carried out by Nikolaus Liechtenfurtner, a local artist. The Freisinger Heimatmuseum (Museum of Local History) is also located in the four-aisle building ot the lyceum. In 1674 prince-bishop Albrecht Sigismund von Wittelsbach donated the St. Mary's column for the Marienplatz . The figures kneeling at St. Mary's feet are the patron-saints of Freising. Alongside the mainstreet, gothic buildings take turns with those ot baroque and classical style. The extraordinary facade ot the registry office at the Rindermarkt is the exquisite work ot Johann Baptist Zimmermann who applied ornate stuccowork to the unadorned northside ot a canon's house in 1720. In order to decorate the interior ot the church of the Prämonstratenser-monastery St. Peter and Paul with frescos, Johann Baptist Zimmermann returned to Freising thirtysix years later. Todays parish-church ot Neustift was built between 1751 to 1756 and is one of the most important rococo buildings in Bavaria. Well-known artists like Ignaz Günther, Christian Jorhan and Franz Xaver Feichtmayer participated in the interior decoration. The former monastery houses today the Landratsamt, the regional administration. An exhibition on the second floor of the building is dedicated to the Prämonstratenser-Chorherren, the canons of the monastery, who influenced and formed the spiritual life in Neustift. Between 1020 to 1803 the Weihenstephan hill served as the seat of a Benedictine monastery. Due to secularization, the church and convent were demolished in 1811. The only remains are the eastern wing and the hall in the southern wing of the building with a hall decorated with frescos by Hans Georg Asam. The Weihenstephan abbots' former courtyard is definitely worthwhile visiting. Nowadays the yard is looked after by the Staatliche Versuchsanstalt für Gartenbau, the state research institute for horticulture. The research institute is also in charge of the plantation of the herbaceous perennials, which is the known to be the best of its kind in Germany. Modern contemporary art has also become established in Weihenstephan. A wide variety of new artifacts complete the collection of modern sculptures around the Technische Universität (University ot Science and Technology) and Fachhochschule since the 1976s. Only ruins remain of the roundchurch, built by the Asam brothers in 1720 at the southern slope of the hill on top of the Korbiniansbrünnlein, Korbinians well . The still existing spring is said to have performed miracles and healings over the centuries. Another place of pilgrimage is situated north of Freising. Past chapels and through the woods you will reach the pilgrimage church of Der Gegeißelte Heiland in der Wies (7), the Flaggelated Lord in the Meadow. The charming rococo church has been a place of pilgrimage since 1748 because of the painted copy of the Steingadener Gnadenbildes. At the end of your visit to Freising you will share H. W. Riehls opinion, one of the well known travelling writers of his time, who wrote in 1806: "If you haven't seen Freising, you do not know Altbayern (Old Bavaria) at all!"